Will you hate me if I told you that I already entered a short EUR/AUD position hours before the ECB rate decision? I was so giddy about getting a good entry price that I completely forgot to post a quick forex trade update. Sorry! 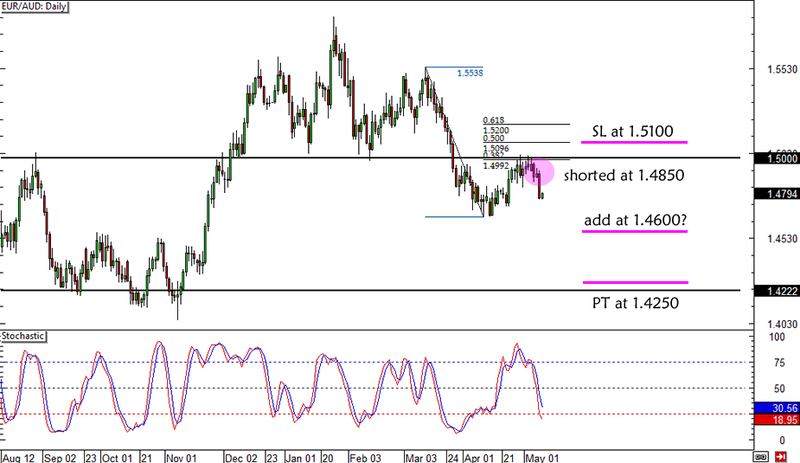 In case you’re wondering what I’m talking about, you should check out my EUR/AUD long-term short trade idea first. After posting and reviewing my trade idea blog post, I realized that the pair would probably just keep edging lower as the ECB rate statement drew near. After all, Draghi and his men were being nagged to ease monetary policy by several euro zone member nations and even the IMF! Aside from that, I was convinced that the strong Australian jobs release in the Asian trading session could be enough to keep the Aussie supported throughout the day. As you can see from my entry and stop loss levels, I figured that I’d be more comfortable with setting a wide stop while having a trade open during a top-tier market release. This way, I could cut my losses quickly if the event doesn’t turn out in my favor. I was able to short at the 1.4850 minor psychological level and I set a 250-pip stop at 1.5100, just a few pips above the 50% Fib. Since I’m looking to hold on to this as a swing trade probably until the ECB finally gives in to easing pressures, I have a large 600-pip profit target. I’m even considering adding another position and trailing my stop once price breaks below the next lows around 1.4650. After all, Draghi already hinted that they could ease in June if inflation forecasts remain weak. Short EUR/AUD at 1.4850, stop loss at 1.5100, profit target at 1.4250, 0.5% risk. I could add another position at 1.4600 and have a 250-pip trailing stop once price breaks below the recent lows. If you’re thinking about joining me in this, make sure you check out our risk disclosure!